Charlotte - Sergio Garcia has a new bride and a green jacket, but what he lacks on the eve of the PGA Championship is the form that brought him a major breakthrough at the Masters. The 37-year-old Spaniard will tee off alongside Open winner Jordan Spieth and US Open champion Brooks Koepka in Thursday's opening round at Quail Hollow struggling with his game. "The last month and a half, it just hasn't felt as fluid as it usually does," Garcia said on Wednesday. "It was definitely better at Augusta for sure. My swing was behaving a little bit more the way I want it. "That doesn't mean that I'm playing badly. I don't see all the shots the way I want them. But it doesn't mean that I'm hitting the ball poorly. "I've always been a feel player. So if I feel something that works and I can ride that feeling throughout the week, then we should be fine. If not, we'll fight with what we have and try to do the best possible." Garcia married Angela Akins on June 30 in Texas with singer Kenny G performing. Garcia wore the green jacket he won in April when he captured the Masters for his first major title in his 74th major start. "We're at a golf tournament. We're not going to start talking about the wedding and everything that went on with it," Garcia said. "It was a great day. Angela and the wedding planner did an amazing job and we all really enjoyed it. We had a lot of good friends there and family and it was a wonderful day and we'll cherish it for the rest of our lives. But we're here to play golf." And while his golfing isn't where it was four months ago at Augusta National, fifth-ranked Garcia has already had a successful season no matter what unfolds at the year's last major. "You do think about that. 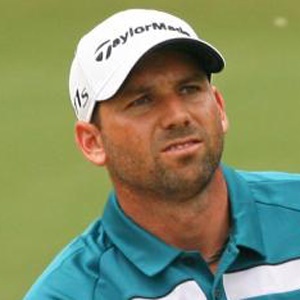 You do think whatever happens, I've already won the Masters and it's amazing," Garcia said. "But at the same time, it doesn't mean that you're not going to go out there and try as hard as you can, because that's what we do. That's the only way we know how to play. And if I didn't care, then I wouldn't get angry when I don't play the way I want. "So you do have that in the back of your mind, feeling like I've already achieved something amazing this year. But at the same time, you still want to go out there and play the way you know how to play and contend and have another shot at it." Since the Masters, Garcia's best showing was a runner-up effort at the European Tour's BMW International. But he hasn't cracked the top-10 otherwise, sharing 21st at the US Open, 37th at the British Open and 39th last week in Akron. "I'm not coming in with the best momentum in the world right now, but we are going to go out there and hopefully be as committed as possible, be confident and hit some good shots," Garcia said. "Because the way the course is playing right now, we're going to need it."